‘Wellness’ is a bit of a buzzword at the moment. It’s all over Instagram, Buzzfeed and the cover of almost every magazine that our mums buy. But for once, it’s a buzzword that actually means something: taking care of yourself. In 2016/17, 526,000 workers reportedly suffered from work-related stress, depression or anxiety in the UK, according to the Health and Safety Executive. Not only does that result in the loss of 12.5 million working days, but we believe it should never come hand-in-hand with working. Why have a wellness week? At Signal, we already get free fruit, a subsidised gym membership and a cycle to work scheme - cushty. But we wanted to kick the feel-good vibes up a notch. That’s why our Edinburgh and Cheltenham offices have both recently devoted a week to wellness; to find out how giving our bodies and minds a little extra TLC can help lift the spirits of everyone in the office. Who would have thought stepping away from your desk would make you more productive? It’s true. Because instead of stressing (and stressing out everyone else), learning to take care of ourselves means we’ve got time for the important stuff - like doing the best work of our careers and being the best versions of ourselves outside of work. Cheltenham’s Wellbeing Week took place in January. Our colleagues tried their hands at a number of healthy activities including fitness, yoga, massage and physio sessions. And they rounded off the week with some therapeutic teas and a hearty, healthy breakfast - even creating their own pedal-powered smoothies. 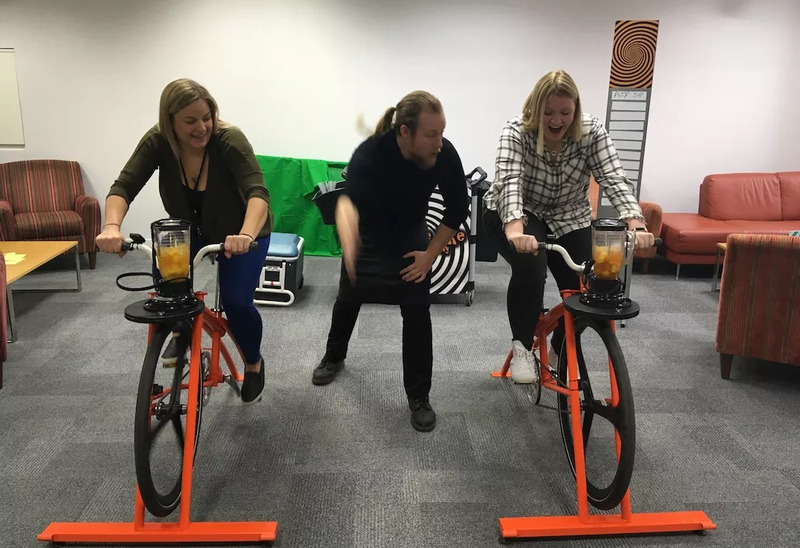 In Edinburgh, we waited for the snow to finally clear up (or so we thought), and teamed up with our sister agency Leith for a Wellness Week in April. Here’s what we got stuck into figuratively, foodily and as a consequence of trying out yoga. “If it hurts and tastes funny, it's good for me, yes?" It’s fair to say we were well-fed this week (pun intended). But with great power eating comes great responsibility to work it off again. So we alternated between healthy grub and all things active - ranging from the reassuringly gentle to the impressively acrobatic. We started off with a little boost from Quay Commons. They delivered some organic smoothies that turned out to be as healthy as they were tasty. Loaded up with vitamins and made to improve digestion and encourage healthy bones (which came in handy later in the week), as well as promoting healthy cells and brightening skin. Get in. Next up, was yoga. Take one barge, invite along local teacher Emma with ten yoga mats, and 20 would-be yogis and you’ve got yourself a yoga studio. At least - for as long as you can hold the pose without falling. And even though not all of us mastered the perfect downward dog, we still felt better for the effort! What’s the best way to start Hump Day? A fantastic breakfast we hear you say (go along with it, even if you didn’t). That’s exactly what we got. Quay Commons brought up their treat-filled trays once again. This time, filled with deliciously fruity bircher muesli. We were offered a whole range from pear through to watermelon, each as delicious as the next. Although we had to hold back some staff and remind them that it wasn’t a buffet and that they had to share. When you think of mindfulness, you probably picture a deathly silent room and a few confused faces. And you wouldn’t be wrong. But it turns out there’s a lot more to it. Taking a few moments of meditation and mindful movement gave everyone a nice fuzzy feeling. Plus, even self-confessed slouchers like ourselves now have a new-found respect for sitting up straight. Take that stress/bad posture. It also helped that our mindfulness instructor Stuart was also offering short massages to anyone who wanted one throughout the week. And relaxxxxxxxx. Two things we are certain of: it’s pretty rainy in Scotland, and you can never have enough cups of tea. So, we thought we’d combine the two, and switch a rainy Thursday afternoon for one flooded with tea. Thanks to eteaket for bringing in a few of their tastiest flavours to try. Everything from their special Buckthorn morning pick-me-up to a love-it-or-hate-it Matcha latte. Special points to this one for #InstaValue. Not too salty. Not too sweet. There’s a trick to making a delicious bowl of porridge - just ask Goldilocks! Luckily for us, Quay Commons were on the case again. Delicious, healthy porridge to kickstart our Friday. Can’t argue with that! And for those up for a different kind of challenge, we finished off the week with a challenging session at Primal Gym. Think monkey-bars, rope-swinging, and everything you loved doing on the final week of P4 gym-class. Only this time, you’re an adult, and everything seems a lot more scary than when you were a kid. Teams of five to seven took on the challenge. There were a lot of sore limbs the next morning. And a few smug face in Team 3 - the outright winners or ‘prime gymers’ if you will. What did the staff actually think? And when we asked who’d want to do it again, almost everyone said yes. Or more accurately, “wellness week was WELL GOOD!” - we see what you did there. And while #WellnessWeek may be over, we’ve not given up our weekly yoga classes. Shoutout to Mairi Wilson for co-writing this blog with me. If it wasn't for her, there would be spelling mistakes, grammar issues and way more GIFs. 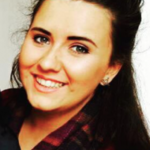 Shannon is our human spreadsheet but HR insist we call her our Digital Advertising and Marketing Executive. She is responsible for campaign planning, execution and analysis across all of the agency’s social and paid media clients. 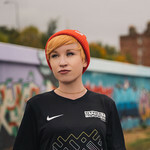 Mairi is the copywriter half of one of our Creative teams here at Signal. She helps turn a brand’s message into a conversation.